We provide consumables for industrial inkjet printers of the following brands: EBS, Domino, Markem Imaje, Videojet, Hitachi, Linx. In cooperation with the biggest ink production house of Great Britain, we are able to cover every need for inkjet consumables for all types of industrial printers (CIJ, DOD, LCP, HRP). As the most popular ink type, solvent inks can be applied to a wide range of surfaces. Solvent inks are suitable for external printing, since the ink’s composition is durable, water proof, resistant to scratches and UV radiation, without further need of extra protective layers. With a plethora of colors, we are able to cover every printing need. Those colorful pigmented inks for continuous inkjet printers offer great stability and excellent adhesion to any substrate, such as plastic, metal and glass. Those high quality inks have a a wide viscosity range and offer and excellent printing quality. Some common uses of pigment inks are: plastic and glass containers and substrates, wire labeling and coding, high contrast printing, as well as scratch resistant and wet surfaces. 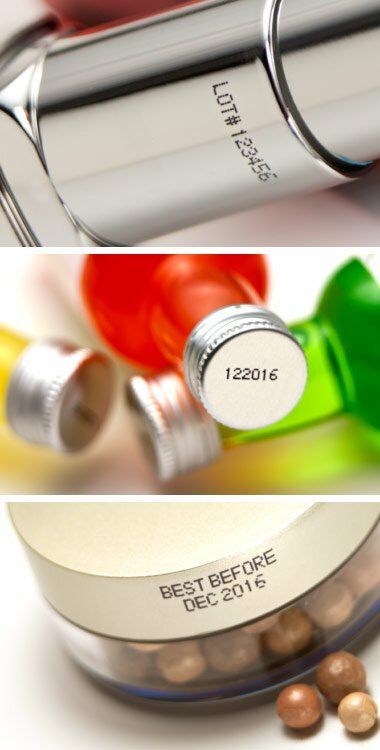 Durable dye-based inks, great for metal, plastic and glass and extremely suitable for food packaging coding. They are most commonly used in the coding process of bottles and soda cans. Extra durable to water and carbohydrates and the number one solutions when it comes to marking eggs.